Contact cheapflights@southafrica.to to book an Overland Tour. Blyde River Canyon, Kruger National Park, Swaziland, Ponto d'Ouro, Mkuze Game Reserve, St Lucia, Durban. Nelspruit, Kruger National Park, Blyde River Canyon, Swaziland, Mkuze Game Reserve, St Lucia, Drakensberg, Royal Natal National Park, Golden Gate. Martins Drift, Nata Lodge, Makgadikgadi Pans, Maun, Okavango Swamp, Victoria Falls. This 5 day camping itinerary for South Africa & Lesotho will take you through the Free State and into Lesotho. Your journey will test you 4x4 skills, you'll truly enjoy an 'off the beaten track' experience with mountain roads and passes. What can be more relaxing than being up in the fresh mountain air overlooking the amazing scenery that is Lesotho. If applicable additional game drives, international flights, visas, overnight accommodation other than roof top tent, alcoholic beverages, restaurant meals, tips and curios. Drinking alcohol during the day and whilst driving in strictly forbidden. After arrival at Johannesburg airport, you have cleared immigration; pick up your luggage found your way through customs, your Safari leader will meet up with you. You will be taken to Chimhavira’s South African Office, not far from the airport, have a chance to freshen up, pick up your Landrover, and check through the equipment. After all of the required formalities are finished, you'll be set for your 'great adventure'! Your Safari leader will ensure you stock up on supplies along the way; the first leg of your trip will take approximately 5 hours. Total distance on Day 1 is approximately 450 km. Today we will have an early start and head off for the Golden Gate Highlands National Park, nestled in the rolling foothills of the Maluti Mountains of the north eastern Free State. The park derives its name from the brilliant shades of gold cast by the sun on the park's sandstone cliffs, especially the imposing Brandwag rock. Lesotho, 'The Kingdom in the sky' is a poor mountainous state with spectacular scenery and colourful Basotho culture. The village, Malealea, is unique; the lodge is located in the middle of the village and a dynamic cooperation has grown with the surrounding villagers. This lodge is often been cited as the perfect example of responsible tourism. You can admire the breathtaking landscape from the back of a Basotho pony. Here we will enjoy a morning drive past the Botsoela Waterfall with a circular route through remote villages back to Malealea. 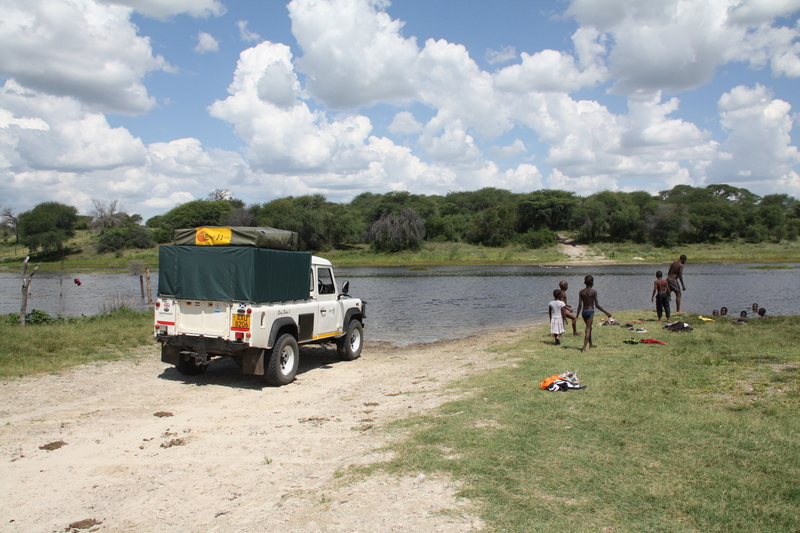 This leisurely drive will take us around two hours, but we will be stopping and walking, it is spectacular in a 4x4. This trip will only be attempted in DRY WEATHER. This hand-built road hugs the side of a mountain. Today we will be returning to Johannesburg, the drive is around six hours so we will have a leisurely breakfast and then set off towards the big smoke. Total distance on Day 5 is approximately 550 km. Review of overland South Africa tour from Johannesburg to Drakensburg to Kruger to Zimbabwe to Namibia. With this itinerary you will visit the highlights of northern South Africa. We’ll start off with the Kruger National Park, by day looking at the amazing wildlife, in the evening you will be sleeping in the wilds of Africa. We will also take you through Swaziland, a true 4x4 country. We will traverse mountain roads with breathtaking views through to Mkhuze. At Mkhuze you will find all kinds of wild animals, large and small. To finish off this amazing package we will drive back to Johannesburg through the impressive Drakensberg Mountains. We are thrilled to bring to you this truly 'off the beaten track' experience. After a relaxing day its time for a hearty breakfast and then lets go find some wild animals! We will drive through to the Kruger National Park ‘Numbi Entrance Gate’ where we will have most of the day to go on a game drive. You will be fascinated at all kinds of different animals you spot during the drive. Along the way we will be making stops at a few of the many camps or rest stops along the way to stretch out for a bit. This evening we will set up camp in one of the small overnight camps. Your roof tent on top of your 4x4 is the idea place from which to listen to the night sounds of the animals, listen for the cry of the ‘Fiery necked nightjar’. Total distance on Day 3 is approximately 150 km. 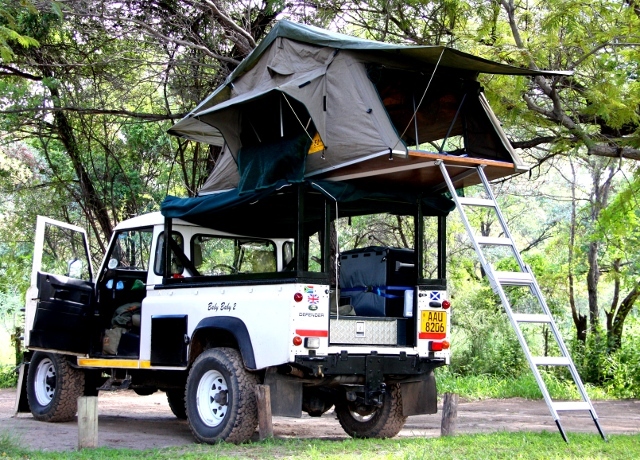 Now it's time for some serious safari activities on your camping safari in South Africa. Wake up early today so that you will be able to go on your own private game drive on your way to Kruger's Orpen gate. You'll be driving over unpaved roads to your next accommodation which lies in lion territory. Provided we have not taken too long enjoying the sights along route we will arrive in time for lunch. In the afternoon, just as the heat of the day is subsiding we will jump into our land rovers and head off for an afternoon / evening game drive, if you prefer why not go on a professionally guided walk. We should not have any problem spotting animals; this area is known for the large number of animals roaming the land freely since there are no gates to keep them away. Even lions venture into camp from time to time. On return to the camp, we will prepare a delicious dinner whilst sharing the days game drive stories, who knows we may even have other participants by the campfire. Total distance on Day 4 is approximately 95 km. Today we’ll go on another adventure, the bush is at its' most beautiful just after sunrise and this is also when you'll have the best chance of spotting wild animals (at times you can get extremely close). Lions, impalas, elephants, every day bring different experiences in the bush. Around mid morning we will arrive back at the lodge a lovely and have a hearty breakfast, afterwards you'll have some time to relax and cool off in the swimming pool. If you can't get enough of wild animals, well you are in luck! Have a seat under a shady tree, enjoy the scenery and why not read one of the books from our wildlife library. In the afternoon you can go on another game walk or game drive and afterwards in the evening you can enjoy the campfire. After the morning game drive and a good breakfast, we’ll leave the camp, around 10:00 is best, and head for the third largest canyon in the world, Blyde River Canyon. We’ll head towards the Orpen Gate where we will leave the Kruger and make our way towards the town of Graskop. We will take a break along the way and have a pick nick at one of the many waterfalls when we feel like a break. The Blyde River Canyon National Reserve is about 26,000 acres in size and the canyon itself is 30 km long with panorama view spread out over the entire area. Tonight we will spend the night at a spacious campsite with a swimming pool, bar/ restaurant and a supermarket. Total distance on Day 6 is approximately 170 km. Now we are on our way to Swaziland, we will head through Nelspruit and travel on to Barberton; an old gold mining village with beautiful houses in a mountainous subtropical area. Once you've left the village you'll slowly start to climb the 4x4 trail, the Bulembu route, towards Swaziland. At the Bulembu border crossing you will get your passport stamped and you are in Swaziland. The beautiful mountain trail makes an enjoyable drive. Our route will take us to Piggs Peak and from there we will head towards the capital of Mbabane. Should you want to we can stop here for a visit to the local markets, we will need to stock up on supplies anyway. Tonight we will be spending the evening in the Ezulwini Valley and the Mlilwane National Park. The campsite has a bar should you want a drink, restaurant and a swimming pool. In the evening you can sit back and relax by the campfire. Today you'll be able to explore the park by 4x4 once again, in search of large or small wild animals. Around 11:00 we will be leaving the park and continuing on our way towards Cape Vidal, the coastline behind St. Lucia Park. The coastline is made up of (enormous) sand dunes that border on the Indian Ocean. It's a great location for swimming, and snorkelling. Tonight we will be spending the evening and morning at the Cape Vidal campsite. Before we leave we will be stocking up on supplies at a supermarket in St Lucia. The supermarket has a broad selection of products and long opening hours. Total distance on Day 10 is approximately 170 km. Today we will have all the time needed to explore this area. There are many spectacular views, the look-out points are clearly indicated for easy access. There are also various hiking trails in this area 2, 4 or more hours. Choose the duration of your hike and your walk will be sure to take you over narrow paths and trails and climb over boulders and through small trenches. Enjoy the outdoors and enjoy a vigorous hike.